People talk nowadays about educational multimedia tools, such as computer textbooks and encyclopedias (of the universe, of history, of nature), which in the course of opening up virtual reality communicate with the written word, illustrations, photographs, reproductions, quotations from documentary or feature films, still and animated images, speak with a human or animal voice or that of instrumental music, or the roar of the big bang. Sometimes, as anthropological analyses of surviving primitive cultures show, the poetic text itself, seen in relation to natural language, has no meaning; it is composed from meaningless words, from foreign borrowings, contains compound constructions that are, so to speak, unrecognizable in the system of colloquial speech – and yet its meaning can be ‘understood,’ because we can understand a situation in which it is acceptable to speak that way, to use precisely that form of utterance. Balcerzan distinguishes the features that decide whether a cultural text is dominated by “feuilletonistic ambition,” “reportorial direction,” or “essayistic impetus.” He finds that: “the basic form of a text that matches the reportorial intention is the bulletin […] informing about the factual state of affairs”; “the essence of the essayistic intention” is defined, for its part, with a quotation from Szymborska: “questions posed to oneself,” whereas the embryonic form of texts with an essayistic bent is the aphorism; “the element of the genre called the feuilleton is language as a storehouse of stereotypes,” and the substance of texts belonging to the feuilletonistic paradigm consists “of cultural customs and the common creeds contained therein,” “the simplest form here is the language joke” and other kinds of humour. The reportorial intention can most easily be grasped in the many different manifestations of veristic, naturalistic, and realistic art (for example painted portraiture or historical scenes), or more generally in all struggles with mimesis, whereas it is hardest to recognize in music (Balcerzan here gives the examples of “roots music,” “musique concrète,” and “reportage from the phonosphere”) He sees the essayistic intention carried out “both in expository prose, dramas, or novels full of ‘essential conversations’ in Witkacy’s words,” as well as in the films of Federico Fellini and the paintings of Edvard Munch, Pablo Picasso, and Jerzy Nowosielski. In the feuilleton category, the author names, among other things, graphic jokes, caricatures, film gags, burlesques, and all types of parody, whether in the plastic arts, theatre, film, music, or forms of advertising. Many works’ design aspire to more than merely being a translation between sign systems and using language as an intermediary. From ancient times, we have merely to think of the tradition of technopaegnia and carmen figuratum, continued with the development of concrete poetry. As we can see in the map of genres in, for example, “Podróż zimowa” (Winter Journey) by Stanisław Barańczak, which coexists with the eponymous Schubert melody that inspired it (the initial musical notation is placed above each corresponding poetic fragment); did not the author himself suggest that “readers will get the most out of the poem if, before or while reading it, they listen to one of the available recordings of Winterreise”? Where would Witold Wirpsza’s “Komentarze do fotografii The Family of Man” (Commentaries to the Family of Man Photographs), in which poetic documentation does not limit itself to ekphrasis and the accompanying photograph does not present a convenient “reading scenario” but rather creates a coherent whole with the poem, fit into the traditional theory of genres? These examples come from very traditional cycles and “transmissions.” A separate and enormous problem is presented in this regard by works created using computers and the internet, including, obviously, games. That is why the challenge facing multimedial genre theory consists not only in studying “mechanisms of transmutation” (in both directions, in the relationship between literature and the other arts) or witnessing the intersection of genre forms from various planets of the semiosphere, but also in understanding works of literature and the multi-textured, heterogeneous “hermenutical phenomena” they represent. 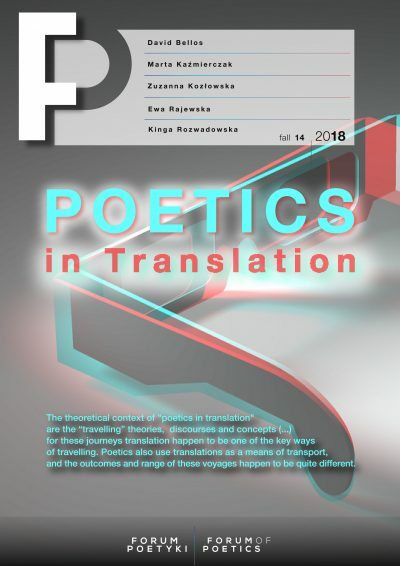 This article discusses Edward Balcerzan’s concept of a “multimedia theory of genres,” intended by him to function as a “metaphor for the present,” representing a division of semiotics that would analyze and systematize the consequences for the study of genres of many different forms of expression in cultural space. The concept of “multimedia” is given consideration in the context of this proposed application. 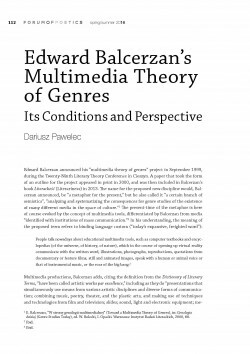 The author of the essay presents Balcerzan’s concept in the context of his earlier proposals within the sphere of genre theory and correspondences between or among the arts, at the same time contemplating some possible approaches to supplementing and further developing this theoretical concept. E. Balcerzan, “W stronę genologii multimedialnej” (Toward a Multimedia Theory of Genres), in: Genologia dzisiaj (Genre Studies Today), ed. W. Bolecki, I. Opacki. Warszawa: Instytut Badań Literackich, 2000, 88. Ibid. The passage quotes the definition of “multimedia” from the third edition of the dictionary, edited by Janusz Sławiński and published in 1998. W. Kopaliński, Słownik wyrazów obcych, Warszawa: Oficyna Wydawnicza Rytm, 2000, 339. E. Balcerzan, “Granice literatury, granice historii, granice granic” (Borders of Literature, Borders of History, Borders of Borders), in: Polonistyka w przebudowie (Polish Studies Under Reconstruction), vol. 1, ed. M. Czermińska. Kraków 2005, 319. E. Balcerzan, “Systemy i przemiany gatunkowe w polskiej liryce lat 1918-1928” (Genre Systems and Transformations in Polish Poetry 1918-1928), in: Problemy literatury polskiej lat 1890-1939 (Problems of Polish Literature in the Period 1890-1939), ed. H. Kirchner, M. R. Pragłowska, Z. Żabicki. 2nd Series. Wrocław: Zakład Narodowy im. Ossolińskich, 1974, 154. E. Balcerzan: “W stronę genologii multimedialnej”, 86. E. Balcerzan: “Nowe formy w pisarstwie i wynikające stąd porozumienia” (New Forms in Writing and the Resulting Understanding) in: Humanistyka przełomu wieków (The Humanities at the Turn of the Century), ed. J. Kozielecki. Warszawa: Żak, 1999, 376-377. I raise some questions here that I have previously asked in relation to Balcerzan’s proposal in another piece. See D. Pawelec, “Sytuacja gatunku – genologia sytuacyjna” (The Situation of the Genre—Situational Genre Theory), in: Od tematu do rematu. Przechadzki z Balcerzanem (From Theme to Rheme. Strolls with Balcerzan), ed. T. Mizerkiewicz, A. Stankowska. Poznań: Wydawnictwo Naukowe UAM, 2007, 513. See S. Wysłouch, “Nowa genologia – rewizje i reinterpretacje” (New Theory of Genres – Revisions and Reinterpretations), in: Polonistyka w przebudowie, 105-107. E. Balcerzan, “Poezja jako semiotyka sztuki” (Poetics as a Semiotics of Art), in: Pogranicza i korespondencje sztuk (Boundaries and Correspondences Between the Arts), ed. T. Cieślikowska, J. Sławiński, Wrocław: Zakład Narodowy im. Ossolińskich, 1980, 28. E. Balcerzan, Poezja polska w latach 1939-1965 (Polish Poetry in the Years 1939-1965), Part 2, Warszawa: Wydawnictwa Szkolne i Pedagnew bne, 1988, 201. S. Barańczak, “Od Autora” (Author’s Note), in: Podróż zimowa (Winter Journey), Poznań: a5, 1994, 7.